by applying GIS in their communities and across the world. We think fondly of the great explorers who led challenging expeditions to the farthest reaches of the globe—to new continents, the poles, the tops of mountains, and the bottoms of the oceans. Through their explorations, they developed a new understanding of the world, and they came back to share their discoveries. Be they traders, hunters, adventurers, or scientists, all these explorers had one thing in common: they were geographers who learned about unknown places, people, and things and brought back information to share with the rest of the world. About 50 years ago, a new kind of geography was born, and it has opened up our world to advanced forms of exploration— not just treks to remote jungles or uncharted oceans but also research and analysis of the relationships, patterns, and processes of geography. Today, the new geographers use a combination of computers, satellites, and science to produce a much deeper understanding of how our world works. While we know much more about the world today than ever before, parts of our world remain unexplored, and there are many important geographic problems left to solve: population growth, environmental degradation, loss of biodiversity, climate change, globalization, lack of sustainability, urbanization, health care access, poverty, hunger, and more. Although we have made tremendous progress in the last century, we still have a long way to go to develop a comprehensive understanding of our world. To solve these important geographic problems, we need the participation of everyone—not just administrators, scientists, and politicians. Everyone deserves a voice in these important issues. Today, thanks to tools such as geographic information system (GIS) technology, virtually everyone can be a geographer. The tools to explore and examine geography in different ways are widely available, and anyone who uses them has the potential to discoveries and easily share them with the rest of the world. This democratization of geography is leading to a better and more complete and more equitable understanding of our world, and it’s creating additional dimensions in our relationships with each other and our planet. We are all new geographers. 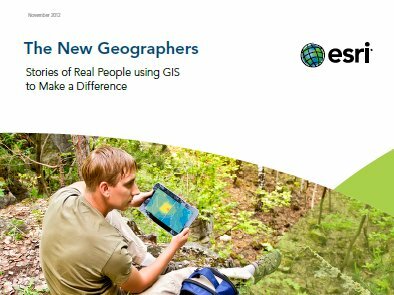 We invite you to read our new e-book about how some of The New Geographers [PDF] are making a difference by applying GIS technology to the needs within their communities and throughout the world. These are people like you and me who are using new technology to make a difference and create a better world. Their stories are inspiring. Yours could be, as well. We hope their stories will inspire you to join the ranks of the new geographers in making a difference in the world.